In the software license monitoring (SLM) console, there are different ways to find out whether your product installations are in compliance with the terms of your product licenses. This topic describes how to find the data you need. Open the Products>Monitored page for information about the products installed on your organization's devices. A product must be moved to the Monitored view so you can find the most information about its usage and licensing. 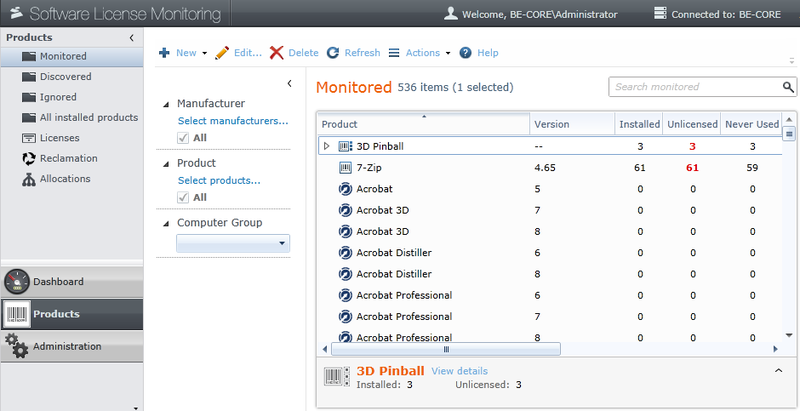 Product installations: Double-click the product name to view a list of devices that have the product installed. Whether a product is currently being used: Look at the Never Used and Ninety Days Since Used columns to see the users who aren't using the product or are rarely using it. Whether a product is properly licensed: Compare the Installed and Unlicensed columns to see if there are more installed copies than valid licenses. Licenses associated with the product: Right-click a product and select View licenses matching selected product to see a list of the licenses that are associated with the product. NOTE: While you'll notice that the Discovered and Ignored product views have the same columns and appear to show compliance data, the data does not accurately represent licenses compared with actual product installations. Only products in the Monitored product view that are associated with licenses will show useful, accurate data. The dashboards contain summary data related to license compliance and optimization. These pages are designed to help you act on the most important problems related to product licensing. They don't give you a complete picture but guide you to the issues that should be resolved first so you can reduce costs and improve efficiency in your use of software. Audits dashboard: This page includes reports that are useful when you're preparing for an audit of your product license usage. Compliance dashboard: This page includes reports that show you products that are out of compliance with license terms and need your attention. License Optimization dashboard: This page includes reports that estimate the savings you can gain by removing unused products from devices in your organization. SLM reports bring together complete reporting data for many aspects of your license compliance and usage. Use reports to find all details for a particular issue or need, and then export the data or email the report for others to act on. Audit reports: These reports are useful when you're preparing for an audit of the your license usage. They include audit flags such as monitored products without associated licenses and licenses that don't have supporting data, such as invoice or purchase order numbers. Compliance reports: These reports include details for all products and licenses that are out of compliance. They include an overview of license consumption for all products, total costs to bring products into compliance, and so on. License optimization reports: These reports provide details that can help you optimize your organization's use of its products. They include lists of unused licenses, products not used or rarely used, and other related data.